On Saturday, we did a little bit of a photo shoot which led to other things, but one of them was making a dummy that was life size. His name is Fred. We had a really fun time taking him and putting him in the boot (trunk) of the car, and then asking one of the members if he knew how to hide a dead body. He thought we were joking until he saw the 'body' in the car. He jerked back and muttered a few things and it took him a little bit to realize that it was just a dummy. His face was priceless, and I wish that I had taken pictures of that, but I didn't. I did however take pictures with Elder Heaton, Fred and I. Fun times that I'm going to remember for the rest of my mission. We were just sitting down (to teach a family) ... when a gendarme (police/soldier) comes in and sits down to listen. We prayed and started teaching the family and he starts interrupting all the time. We kept teaching as best we could...Anyway, once we (answered his question) and got back to teaching the family he kept interrupting. Then we just layed down our testimonies and said nothing could separate us from our knowledge. 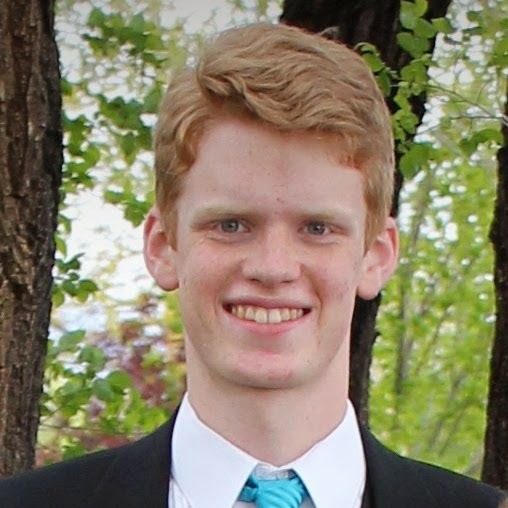 Elder Cartmill was on fire. With the Holy Ghost of course. Then we closed it off and he left. I was a little bummed by how it went, but we made sure not to argue with him and we didn't get into any Bible bashing with him. Then once he left the family freaked out and were all just so thrilled because the missionaries before had apparently gotten really confrontational and angry or just embarrassed and didn't know what to say when someone tried to argue with them... Anyway, it was really cool after that and the Spirit was way strong, which was great because the guy was pretty confrontational and was doing a pretty good job of keeping away the Spirit at the beginning. The family was still freaking out right before we closed, so we asked them if they wanted to be able to feel this all the time, they said yes of course! So then we snagged them and got them to promise to read the Book of Mormon every day and come to Church each week and work towards baptism. It was great! There is a tradition that goes back as long as I can remember to honor those who are currently serving missions. 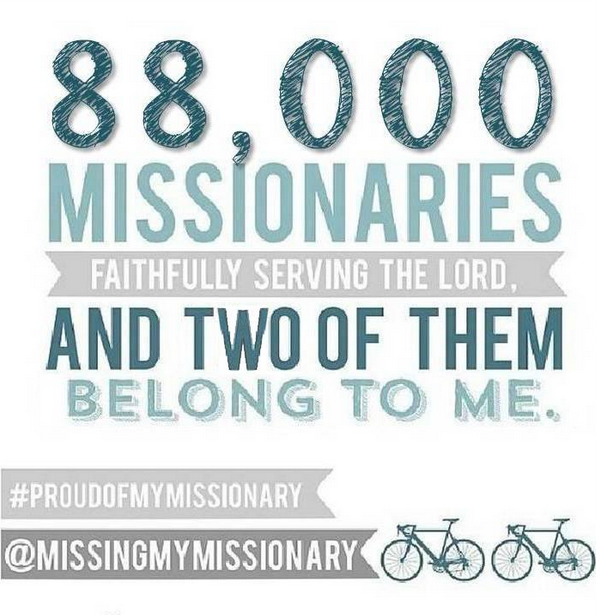 Just before they leave, they are "given" a plaque with their picture, the name of their mission and when they are serving, and sometimes the missionary's favorite scripture. The missionary-to-be gets to hole the plaque during the Sunday meeting, but then it is hung up at the church. I love looking at the collections of missionary plaques and seeing where they all went, and I always have a little prayer for each of them. They are in the Lord's hands. Alec and Ben were no exception, and they have their handsome faces on these nice wooden plaques. However, when we moved, the old ward had to give us the plaques so we could take them to the new ward. Due to conference and maternal forgetting, I was able to keep the plaques for a few weeks. I loved, loved loved seeing their smiling faces in my room. I really didn't want to give them up. Sigh. Eventually, I did hand them over to the new ward, and they hang up at the church now. I suppose all mothers get to the point where they have to share their babies with the world. Maybe I'll have to make up my own shrine. I thought I'd take a picture of my me and the man building a playset for the kids. See, we bought this nice, redwood fort/sandbox/slide/swingset thingie at the end of the summer. I've been wanting a swingset for the little ones for a while, and as I passed the "play outside" aisle in the hardware store, there was only one swingset left - and it was 70 percent off! I have a hard time making snap decisions. I said yes, then no and started to walk away, then reconsidered and looked terribly wishy washy for the longest time. Finally, I put my hand on the giant box, as if to protect it from the imaginary mob of Black Friday shoppers, and told Chris to go get us a big flatbed cart. We brought it home (with three kids! In a smallish vehicle!) and unloaded it in the back yard. When Trent got home, I had to sheepishly confess my spontaneous purchase. He was actually proud of me. The next morning, we walked about the yard, trying to decide where to put it. Here. No, away from the cement. Near the house. By the chicken coop. This spot is more level; that one is rocky. But we never felt really happy about any of the places we thought to set it up. So we covered the box with a tarp and left it under a tree until we could come to a decision. Within a few days, we were packing up our entire household and moving away. I'm glad we didn't set up the swingset, or we would have had to take it right apart again. We moved the by then soggy box and piled all the lumber in our new backyard. My dad has been eyeing the growing pile of... things on his basketball court. He even made mention that he would like to use the court again to play some ball. (He hasn't played basketball in years.) I know he is anxious about us moving in, and the amount of stuff a big family uses. We'll get organized, I promise. Unfortunately, this has turned out to be the slowest-to-get-settled moved that I've ever had (and it's the 15th move for me since high school!). It's just a challenge to move all your life into a place that is already full of someone else's life. Anywho, we started setting up the playset today. I'm so grateful that Dad found the instructions and rescued them from the rain! Trent and I worked for about 5 hours on a project that the instructions said takes 2 to 4 hours. They lie. We're nearly a third done, and I was too busy to snap a cute little with-my-man-selfie as we did a big project together. 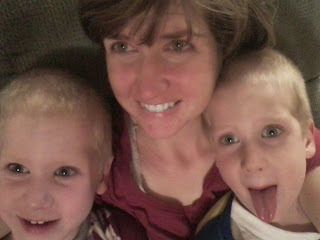 After dark, I came in and snuggled with my babies. They are still babies, aren't they? They love making funny faces on the phone, to the point that it's hard to get them to give me a nice smile. I love them. I even love their unseasonable fuzzy haircuts because they played barber on each other. And I know they love me. I have the phone. Of course they love me. I was sitting on the couch, reading a book when I remembered that I hadn't shot myself today. So I did. I love you my hair ended up all swoopy like I was stuck in the 80's. I also loved how I was able to sneak in a picture of Chris, who hates me to take his picture. It's ok - I hate me to take my picture, too. How many more days do I need to do this? Is three more enough to show my posterity that I really did exist in their lives? If anybody has sent me letters, I haven't gotten them because there is a mail strike here in SA. No mail is getting through, and it is in such a backed up state, even though they are trying to do their best with the mail that they have, and it is backing up, like nobody's business. I've really enjoyed working and being in the field with our investigators. We have had some really good lessons, and have a few of our investigators really solidly progressing towards baptism. Our first date is on the 9th of November, so it is coming up quite quickly. I'm super excited and he is ready for it! I am not a seasoned enough selfie-taker that I can just turn on my phone and snap away. No, the very thought makes me very, very self-conscious. It is partly because I don't want to look like I'm taking a selfie (I must think there is something inherently wrong or vain or selfish about it... need to do some introspection there), and partly because I really do not like being in pictures. But I wanted to show that I did, indeed go out and do something social. With a group of people who were mostly strangers. And at a girlie event, no less. Yes, I went to a baby shower. Do not get me wrong - I am all for celebrating the coming of a new life into the world. I am all for women uniting together in what makes us uniquely feminine. I am all for cheering a new mother into this wonderful and frightening and joyous journey of family-making. And I am all for this particular family. The new baby's mother is a beautiful, gentle young woman, and her mother-in-law is the most kind person I have ever met. Of course I would do what I could to support them. But I do not know how frilly pink streamers and silly party games have anything to do with celebrating a new life. To me, traditional shower games are somewhat of an insult to any shred of intelligence, and the requisite small talk is nothing short of painful. When I had my first baby and was subjected to the traditional shower, I begged my mother to not force me to play party games. Instead, we learned infant CPR and tied quilts. Obviously, I survived being feted, and I adored my extended family for being so supportive and welcoming to me and my new little one. I do not mind being with people, but it is just more challenging. Please, do not stop inviting introverts to baby showers. Just realize that it is more strenuous for me than it would be to an extrovert. The exertion is part of the gift. As an aside, I think I shall send my very naturally-gregarious husband and our equally charming and friendly daughter to the next shower in my stead. They would probably love it! So here I am, standing in the hallway outside the party room. You can see the dangly pink thingie in the doorway - an invitation to enter, I suppose. If you look very closely, you might even be able to make out the pile of pinkly-wrapped gifts on the table just past some very kind woman-knees. See, I can be social sometimes! Next time, I'll bring some knitting. I'm not sure what caused the sad eyes, the drooping head, or the knuckles dragging on the floor, That's what "I'm hurt" looks like among the younger set of our home. I'm sure I didn't teach them to do that, but even their oldest brothers hunched their backs, hung their heads, leaden arms hanging limply from the shoulders, slowly slinking away when they felt bad. It's pretty pathetic looking, and it certainly tugs at my mother-heart. I was working at the counter, trying to do some paperwork, when this little one of mine moped around the corner. His eyes on the floor, his feel shuffled along. I'm not sure how he didn't walk into anything, but he wouldn't have hurt himself even if he had. He came and stood beside me for a minute, then reluctantly lifted his head to show me his tear-stained face. He lifted his arms and quietly pleaded, "Hold me, Mommy." What else could I do? I lifted him into my arms and held him, heart to heart, for a long, long time. I only released my embrace when he felt better and wiggled to get down. "I'm ok now," he said, miraculously cured, and raced off to play. And I have a record that I was a comforting mother with cozy arms. It's a lot of what I do. We were up in the canyon, all happily shooting the vibrant fall colors. I had my nice camera (that I just found in a box! ), David had the little point-and-shoot, Chris had his phone, and Eddie borrowed the iPhone. After a few minutes, watching them all soak in the view and point out an especially beautiful spot, I wondered what we would do with these pictures. Keep them on the memory card, most likely. I knew I would share some on the blog here, but as I haven't found the camera cords, I wouldn't be able to get the pictures off the big camera. Anything I wanted to share would have to come from the phone. And why would I want to share it, anyway? Usually we share pictures to show that we went somewhere, or to remind us of occasions. I love to look back and see my children happy. My favorite scenic shots are of the view... with my family in front. I'd rather have a picture that tells a story than a postcard-perfect vista. And then I remembered this article about mothers not being in the pictures. I had read it a few years ago, but now it was pushing to the top of my brain. I'm never in the pictures. I'm not. I'm always the one taking the pictures. And my kids may not remember that I was even there with them! I wish I had more picture of my mother, but she was so self-conscious of her appearance. Man, I miss her. Nope. Don't want to be the invisible mom. So I grabbed the iPhone while Eddie was taking his turn with the binoculars, gulped, and took a picture of myself. Hate selfies, but it was a little bit more acceptable this time because this is the only way I could get a picture of Chris. Look! Here I am! I went up the canyon with you, family! And so I'm going to spend the next week (gulp) taking pictures of us doing things, with me in them. I've been better about writing my boys than I have been about writing here. All is can do is mumble something about a mother's love and promises to repent and I'll back-date a few posts I had mostly-written by not-yet-posted. Sorry! We helped one of our investigators move into the other missionaries area and lost them. I'm super bummed about that. I loved teaching them. We got to watch general conference this week, and re watch it when we had time, so it was really cool. I can't wait to get the Liahona with all of the talks written out. It was such an amazing experience to get to see it and to hear it. I love the gospel and it is so amazing how it has blessed me so far. I only wish that I could do more but I can only do the little bit that I can. I have found a new outlet of my personal funds... There is a very good tailor here in Antsirabe and I'm going to get a tailored suit for about $40... I figure if I'm going to get a suit it needs to be at the beginning of my mission when I still haven't lost all of my weight, that way it will fit after my mission too. So today I'm probably going to go buy some fabric in Tsenasabotsy, the big market. And then in a couple weeks I will have my suit. I'm pretty pumped! We've been teaching a lot of the commandments this last week and we have been teaching A LOT about the blessings of living the gospel. If we just trust in God and do what he would have us do, then he will provide for all our needs and our righteous desires too. I love this time of year. I love the colors and the crisp morning air and the crunch of leaves on the sidewalk and the smell of wood-burning fireplaces. I love the return to hot cocoa season. So we went outside to enjoy it. After a drive, we were in the middle of so much fall beauty! Love, love love. I love this amazing world, and these wonderful people. Thanks, Lord, for so much. Happy mama, me. I know, I often write about haircuts. But that's part of what I do. I am responsible for making sure that my children are neat and presentable. And we had a few shaggy dogs running around here. I've searched for the hair cutting scissors, I have. That's why I was in the storage garage yesterday. But no luck. I finally called Grandma (bless the grandmothers of the world!) and Trent brought me over her hair cutting kit. A few minutes later, Eddie looked good again. And shorn. Maybe a bit too short, but that's how he likes it right now. And he's done complaining about the state of his hair. For a few weeks anyway, which is good because Grandma needed her clippers back. Meanwhile, I'll keep looking. Looking at this picture, I'm feeling like I want to become a minimalist. Yup. Let's backpack through Europe, honey, with only the things in our packs! No stuff, no furniture, no worries! This, unfortunately, is our storage garage. Or part of it, anyway. The place is huge. We. Have. So. Much. Stuff! A lot of it is furniture, that we didn't have time to sell due to the quick and unexpected nature of our move. A lot of it is movies and cords and screens and wires and dead computers and other electronics. I don't get that one. A lot more of it is clothes - winter coats, snow boots, jeans-to-grow-into hand-me-downs, and baby twin clothes? Some of it belongs to Alec, and some of it belongs to Ben, as we store away their favorite things while they are gone. Some of it is memories that I just can't throw out, and some of it is valuable things that someone thinks should be sold instead of donated. And some of it is my husband, and some of it is Eddie. Hello up there! Better get them out before we turn off the lights. It's been one of those days. Everywhere I turned, someone wanted me. "Mom! Can I play games on the computer?" "Mom? What is for after-school snack?" "Mom? Angel is in the street again." "Moooooooommmmmm <sniffle> heeeee hit meeeee!" "Mom? Oh wait. When will Dad get home?" Mind you, I like being wanted. I think everyone wants to know that they are important. But when my services are so insistently demanded, I get a little worn out. It's kind of like this old Calgon commercial. Watch this - I love it! So when life gets rough, just get in your giant sunken bathtub with some bath salts or bubbles or magic potion and it will transport your exhausted, naked body to the top of an ancient Grecian temple, There, the blue skies and fluffy clouds and amazing vistas will instantly melt away all your troubles. Prerequisites include flawlessly shaved legs (no shaving in a Calgon bath), hair done up in a romantic chignon, and a vase (pronounced vahz) full of fragrant flowers. Sounds like a good plan to me! So as soon as the kids were all tucked in bed, lights turned out, teeth brushed, stories read, prayers said, I headed off for the bath. Yes, it went in that order. I grabbed my new romance book and found a decorative bottle of lavender bath oil with random baby flowers floating around in it. I pulled out a freshly laundered fluffy white bath towel. I even got out a tin of chocolate and mint bath scrub, but it had gone rancid so I put it back. Looking around, I snuck off into the bathroom. Can't have anyone know I'm there, or the bathroom door banging would never stop. I quietly opened the door, flipped on the light, and... Calgon! It's my Grecian tub, just waiting for me! Some imagination required. My mother had a thing with duckies. Cute, no? Here a few snippets from our missionary boys. They both sound happy, so that makes me a happy mom. Conference was my highlight for this week! It was so awesome. I love hearing from the prophets and learning at their feet. They are so knowledgeable, and wise. It is kinda hard to watch here because all of the sessions are out of order, and I still haven't seen the Sunday PM session yet (we will see it later tonight), but it is still an amazing time! I love the gospel and I love the chance that I have to continually learn more and more. I can't wait to get the printed version and reread it again and again. Our bishop commented that he didn't think that it was a coincidence that conference was held on fast weekends. It was different to fast and to watch conference in that spirit. I also have to say that I'm doing the 90 day Book of Mormon Challenge, on top of all of my other studying, and I'm currently half way done with it, and it has been an eye opener. I've learned so much this time reading it through, and it is interesting to be reading from two different places in the Book of Mormon and to see all the parallel lines between the two places. Don't be ashamed of your beliefs. Lots of people are scared to let other people see what they believe and that it's different from most people. For example most people won't let us come teach if they have other family over, but they should be the people that you want to hear the gospel the most. Then lots of people in part member families don't understand how powerful testimony and simple discussions can be in converting the rest of their family. The Lord has promised that if we open our mouths it will be filled. If you're trying to do his work, He will help you every time. We are watching LDS General Conference today. Won't you join us here? Why do we like Conference? The biggest reason is because it is inspiring. There are so many talks on different things we can do to become better, and there are always a few that just hit. Those are the ones I know I need to take to heart and do something about. I always feel happier after I've been listening to Conference. Another reason to celebrate Conference is because I get to share it with people I love. It's just nice to be able to sit around, in our pajamas, and just be together. I love my family. Lots. And it's a good thing we have lots of couches. Oh, and another Conference favorite is the fun food we have. That's a big part of life for a group of boys. We like to just have a table full of food that we can snack on and enjoy whenever we get hungry. It's good fun. This year, we will be spending Saturday with some of this. Oh yeah. Zucchini bread and pumpkin bread are definitely on the menu. David and Eddie will be learning how to make sweetbreads this year. Chris has already made two cheesballs - ranch and Italian - to eat with crackers. And fruit. We have a counter full of fruit just waiting to be cut up and enjoyed. It's a nice way to spend the day. With my family. In my pajamas. Being spiritually and physically fed. That's the good stuff. So I didn't join up with the Nester's write-every-day-for-31-days-in-October project this year. I did last year, and the year before as well. But this year? Meh. I guess it just boils down to a bad case of I-don't-want-to-itis. Sometimes it's nice to be an adult, because no one can make me do things I don't want to. Bwahaha! At least that's what my kids think. I won't go there today. But I don't have to write every day about the same topic for a whole month if I don't want to. And I don't want to. I'm having a hard enough time being coherent in real life right now - being coherent in my writing would be near-impossible. And I did get burned out after the exercise the past two years. I'd rather just keep trying to get in a good habit of writing regularly this year. After all, it's not like I'm trying to write a book. 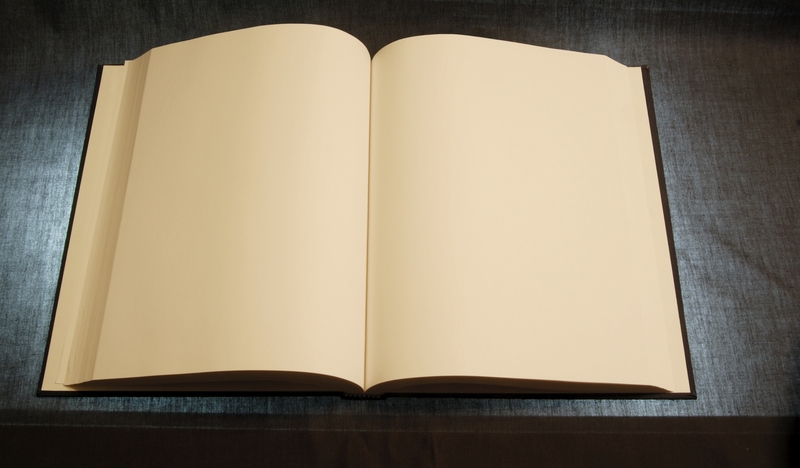 This is what my book looks like. Blank. I went to visit the midwife who so expertly assisted us to get our twins into this world. We got some fresh produce from her garden, some good hugs, and reaffirmation that we are doing ok. After I left, I reflected on what an extraordinary life she had led. So many babies and so many stories! Someone needs to write her book. Really. My husband thinks I should write it, and I'm flattered that he has such a high esteem of my writing. He is so kind. But frankly, I don't have the skills needed to write a book. A biography, no less. I would be terrified at such a huge undertaking. But for today, I think I'll curl up in a corner with a good book that someone else wrote and nurse my I-don't-want-to-itis. Where's my blanket? During the summer, we went to a colonial village where they were re-creating life in the 1700's. It was fun to watch people, dressed in period costume, making and hawking their wares. One booth that especially caught our attention was the baker. 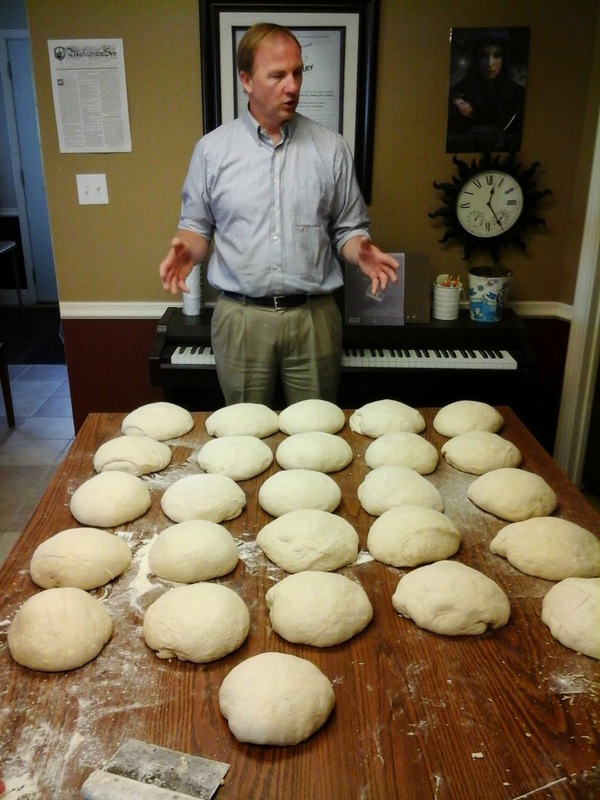 We were lured there by the scrumptious smell of bread baking in their brick oven, and kept there by the skills of a master storyteller as he told us the history of bread and what people ate in colonial America. 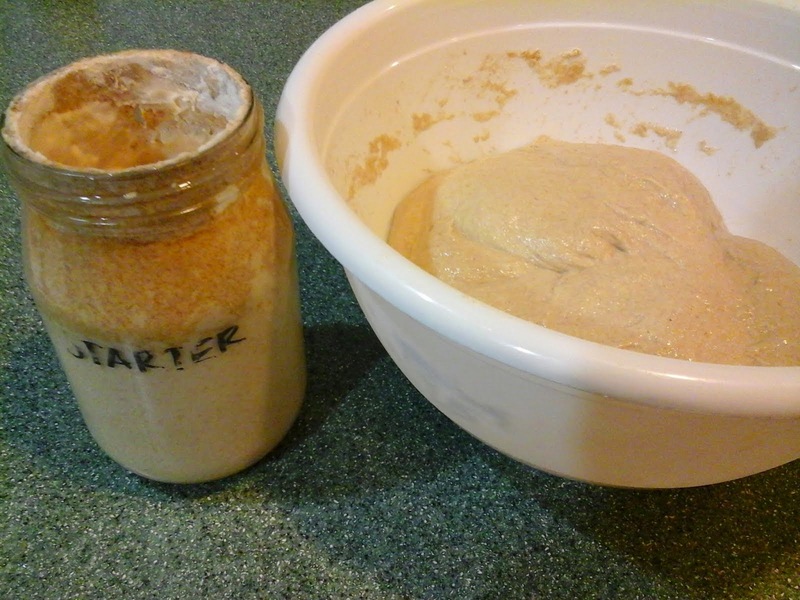 Trent procured a sourdough start and a loaf of hot bread before signing us up for a breadmaking class. The classes weren't held for a few months, so we nearly forgot. But we didn't. We went to the class and had a lovely time. We learned lots of things about our country and its early settlers, and even a thing or two about bread. We helped make a big batch of bread, and I mean BIG! I wish I had the capability to make this much bread at once. The sourdough takes so long that it would be nice to just spend a day and have the week's baking done. Here is Trent, lecturing the dough balls on how to rise. I'm not sure what he was really doing, but it does look instructional, doesn't it? Yes, we actually made 26 2-pound loaves. You should see the size of his mixing bowl! 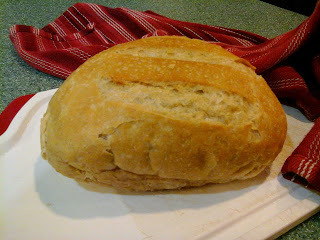 We took home some of the bread dough and made a few more loaves at home. They turned out gorgeous. It would have been perfect if the parchment paper hadn't stuck to their little bread heinies. At first we picked away at the paper, and then, out of burned-finger desperation, sawed their bottoms off. The bread still tasted good, don't worry. Not long after the last crumb of bread was consumed, I promptly forgot how to make it. It didn't even take very good notes. There is some information on his website, but not enough to make me confident in my sourdough skills. So I had to make another batch. I'll re-learn by practicing, I guess. Good thing my dad loves sourdough! The kids tolerate it if it isn't too sour - unless it is hot. Everyone loves hot bread, slathered in butter. The next batch is in the oven, and it is starting to smell wonderful. Hopefully, the parchment paper does what it is supposed to do this time, and doesn't stick. Is is rational to be wanting to build a brick oven in the backyard? P.S. The loaves came out gorgeous! And delicious! But I'm picking off the parchment paper again. Sigh. It doesn't taste as good as the rest of the bread.